Enchiladas Rojas are so popular in Mexico that you will find them in any Mexican restaurant, this is the type of dish that you could use to describe Mexican food: comforting, vibrant in colour, healthy, delicious, simple and use of chillies. 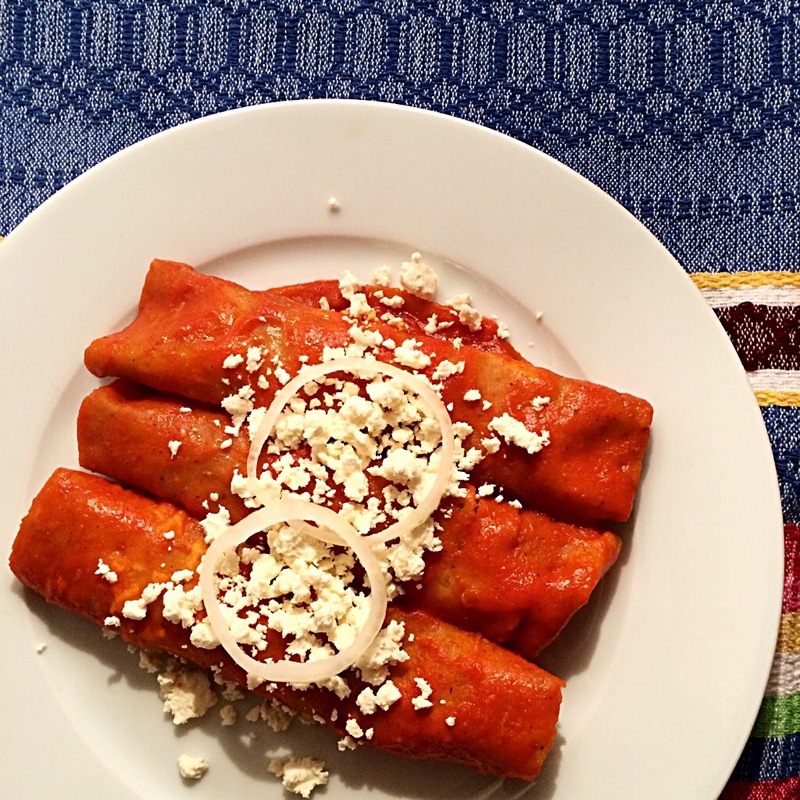 In my family we always use dried Anaheim chillies to make the red sauce, but traditionally is made with guajillo chillies and these are the ones I used for these enchiladas. They can be filled with chicken, cheese or refried beans, I made mine with chicken, I find them more filling. At home in Mexico there is always a big fuss when we eat enchiladas, it becomes like a scene from a Matrix movie fight scene… everybody helps in a kind of magical, stylish & synchronised way. It just flows! Everybody has a job to do and we all have to help otherwise if only one person does them all, that person wouldn’t have time to eat, but I think that is the fun of it, it is very rewarding when everything is ready and we all sit down on the table and after spending around an hour making around 50 enchiladas (err! There are many people in my family and we like our enchiladas) we finish them in no time. This time I only made 10 enchiladas and I had salsa left, which I used the following day to make shredded beef burritos, so if you have salsa left, do not discard it, freeze it if you are not planning to use it soon. I assure you, it will be fun making enchiladas, ask your other half to chip in and help you, at least force them to clean the kitchen after. Have a lovely time doing enchiladas! Heat a frying pan over high heat and toast the dried guajillo chillies, making sure they do not burn. Put the chillies in a bowl and cover with 2 cups of boiling water; leave aside until chillies are soft, about 10 minutes. Drain them, keeping the liquid, put them in a blender with 1/2 cup of the soaking water. Blend until smooth and keep salsa aside. Charred the tomatoes, onion, garlic and fresh chillies until all the vegetables look very charred. Leave aside to cool. Fry the chilli purée in a frying pan adding one tbsp oil, stir constantly until getting a thick consistency. Put the salsa into the blender again together with the vegetables, stock, oregano, baked tortilla, pepper and blend until smooth. Pour through a strainer into a sauce pan and return back to the heat, bring to a boil, and then reduce heat to medium-low, until the salsa has reduce. Add salt to taste and keep it warm. Heat the rest of the oil in a frying pan over medium heat. Using a pair of tongs fry for around 1 min the tortillas in the oil one by one. Then one by one introduce each tortilla into the warm chilli salsa, coating the tortilla then take it out, add some shredded chicken, roll and continue doing this with each tortilla until they are all done. Serve them all in a large plate, scatter some cheese over the top, ring onions and if you want add some avocado slices and sour cream. Guajillo chillies? So many interesting chillies out there! I know! And they are delicious!